Cleaning up our old stories and archive posts, after transferring to the new wordpress blog here on StellaBella, has been taking up my extra time this summer. In addition to other "movin' & shakin" activities in my professional life over the last few months - I realized I have not left room for fun projects, and ideas for the blog. I did however, take my first course (Introduction to Professional Organizing PO-001W), for certification as a Professional Organizer, (the next step in making StellaBella an actual client-based business)! The National Association for Professional Organizers (NAPO), was established in 1986, and today, with more than 4,000 members, NAPO is recognized worldwide as The Organizing Authority. They are dedicated to helping individuals and businesses bring order and efficiency to their lives, and their vision is to have the world recognize the value of organizing and turn to NAPO as the leading organizing authority. Honing and integrating this skill into my own home design and aesthetic, in addition to wanting to help people with life's transitions - this will be one of many building blocks to help me reach my goals! So, while these long summer days drag on, and the heat is slowing us all to a snail's pace - I thought I would also take time to promote a great on-line marketplace I discovered awhile back. Uncommon Goods is all about promoting high quality custom-made and hand-made gifts and merchandise; and located here in Brooklyn! In the world of gift giving, it is always great to customize. The more sentimental a gift is, the more that tangible symbol of your friendship or relationship becomes. Of course, when I think of those type of gifts, I think of engraved jewelry or something commissioned by a professional, that costs an arm and a leg. Well, that doesn't always have to be the case. I'm also a huge fan of the "just because" gifts - that don't have a Holiday, Birthday or Anniversary attached to them. There are so many customizable ideas that you can do yourself, or embellish onto an existing piece. But when I came across the artist Lori Blum's Custom Family Pillow, on the Uncommon Good's feature page - I knew this would be a great gift to my love, and add a personalized fun piece reflecting our first home together! 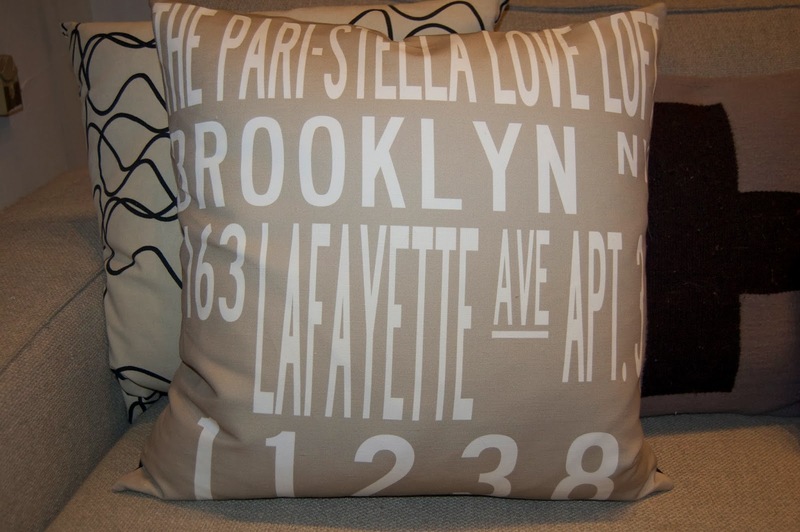 I will admit, this customized address pillow was an Anniversary gift, but I think I would have found ANY excuse to order this sentimental pillow. She also makes a baby announcement pillow (in the same style), and a few other custom pet items for that special pooch/kitty in your life! The pillow did take 6-8 weeks to arrive, but when ordering anything customized - this will be the case, so plan ahead. With all of the colors throughout our loft apartment, the nice taupe color will always be easy to match with other pillows and throws. I hope this piece stays with us for years, and no matter where Ronnie and I live, or where life takes us - this pillow will remind us where we started! The Pari-Stella Love Loft Forever!